ফিরে এলাম নাইরোবিতে। ফিরেই গঙ্গাভাই এবং জিমকে জানালাম সবকিছু বিস্তারিতভাবে। সাথে এটাও জানিয়ে দিলাম প্রথম পরিচয়টা হবে হারারেতে। যুক্তি দিয়ে বুঝিয়ে দিলাম কেনও এই সাক্ষাত ঢাকায় না হয়ে হবে হারারেতে। এরপর শঙ্কা এবং খানিকটা অস্বস্তি নিয়ে সময় গড়িয়ে যাচ্ছিল। এরই মধ্যে একদিন অপ্রত্যাশিতভাবে পররাষ্ট্রমন্ত্রী আমাকে ফোন করে অভিযোগ জানালেন আপনি ঢাকা ঘুরে গেলেন আমার সাথে সালাম দোয়া না করেই! তার এমন খোঁচায় কিছুটা চমকে উঠলাম! বেগম জিয়া কি তবে জনাব মুস্তাফিজুর রহমানকে বিশ্বাস করে সবকিছুই বলে দিয়েছেন! এই সমঝোতা পচনশীল সমাজের নীতি-আদর্শ বিবর্জিত অপরাজনীতির এক কদর্য হিঃপ্রকাশ। এই আঁতাতের পর হঠাৎ করেই ভাঁটা পড়ে ‘ঘা দা নির্মূল কমিটি’-এর কর্মতৎপরতায়। দেরিতে হলেও জাহানারা ইমাম এবং কর্নেল নুরুজ্জামান বুঝতে পারেন রাজনৈতিক ফায়দার জন্য আওয়ামী লীগ তাদের ব্যবহার করেছে মাত্র।এই মনোকষ্ট নিয়ে ক্যন্সার আক্রান্ত জাহানারা ইমাম যুক্তরাষ্ট্রে স্বেচ্ছা নির্বাসনে ছেলের কাছে পাড়ি জমান এবং সেখানে ক্যান্সার অপারেশনের পর মারা যান। কর্নেল নুরুজ্জামান নিজের ভুল বুঝে চিরতরে সক্রিয় রাজনীতি থেকে অব্যহতি গ্রহণ করেন। এরপরের ঘটনা আরও হতাশাব্যঞ্জক। ভারতপন্থীদের সমর্থনে বলীয়ান হয়ে কর্নেল মুস্তাফিজুর রহমান খালেদা জিয়াকে হুঁশিয়ার করে দিয়ে বোঝালেন যে সেনা পরিষদের নেতাদের বিশেষ করে আমার সাথে তার ঘনিষ্ঠতা নাকি তার জন্য কাল হয়ে দাড়াবে। এক সময় আমি নাকি তাকে ব্ল্যাকমেইল করে ১৫ আগস্টের স্বীকৃতি আদায় করে নেবো এবং আগস্ট বিপ্লবের মাধ্যমে রাজনৈতিক পটপরিবর্তনের সাথে জেনারেল জিয়া প্রত্যক্ষভাবে জড়িত ছিলেন সেটাও বিশ্বপরিসরে প্রমাণ করিয়ে ছাড়বো! ফলে প্রতিবেশী ভারতের রোষানলে পড়ে তার সরকারের পক্ষে ক্ষমতায় টিকে থাকাই অসম্ভব হয়ে দাড়াবে! দেশে ফেরার আগে খালেদা জিয়া তার হোটেলে এক প্রাতঃরাশে নিমন্ত্রণ করেছিলেন বন্ধুদের। তার সেই নিমন্ত্রণে সাড়া দেননি কেউই। মনোকষ্ট আর হতাশাগ্রস্ত হয়ে ফিরে আসতে হয়েছিল খালেদা জিয়াকে। খবরটা জিমই আমাকে ফোন করে জানিয়েছিলো। নিয়তির পরিহাস! ফিরে যাই ১৯৯৬- এর নির্বাচনের পূর্বে নাইরোবিতে থাকাকালিন অবস্থায় আমার চাকুরি জীবনে আর একবার যবনিকাপাত কি করে ঘটেছিলো সেই পর্বে। ১৯৯৩ সালে চাচা, খালাম্মাকে সাথে নিয়ে যুগলে ফরজ হজ্ব করে নাইরোবিতে ফেরার পর অপ্রত্যাশিতভাবে ঘটে এক দুর্ঘটনা! একদিন প্রত্যুষে ফজরের আযানের পর অজু করার জন্য বিছানা থেকে উঠতে গিয়ে নিম্মির স্লিপডিস্ক হওয়ায় ও চিৎকার করে মাটিতে পড়ে যায়। পড়ে যাবার পর নিম্মি একদম নড়াচড়া করতে পারছিলো না, শুধু যন্ত্রণায় কাতরাচ্ছিলো। জরুরী ভিত্তিতে এ্যাম্বুলেন্স আনিয়ে তাকে নাইরোবি হাসপাতালে নিয়ে গেলাম। পরীক্ষা-নিরীক্ষার পর ডাক্তাররা জানালেন, লোয়ার লাম্বারে একটা ডিস্ক কলাপ্স করেছে বাজে ভাবে ডিজেনারেটেড অবস্থায়। হতবাক হয়ে গেলাম। নিম্মি বরাবর তার খাদ্যাভ্যাস এবং শরীরচর্চার বিষয় খুবই সচেতন! Within a week it was decided to go to Dhaka. After reaching Dhaka we camped at Minu Fuppu’s house again. But as forced by Shapan and Rosy we had to spend first two three days at their house. Qamrul Haq Shapan Bir Bikram, my only younger brother. The age difference is three to four years. He is a well known freedom fighter and established businessman. In sixties after completing his studies at Faujdar Hat Cadet college he left for the American University in Beirut on scholarship. After graduating from there he went to Germany for higher studies. After getting the degree from there he returned back to the country and set up his own business at the same time got admitted in the IBA department in the Dhaka University to complete his MBA. But before he could get his degree the liberation war started. Right at the beginning Shapan, Badi, Kazi, Shacho, Jewel, Azad, Badal, Alam, Chullu, Samad, Meoya, Rumi, Fazle, Sathe Ali, Ulfat, Mokhtar, Tayab Ali and a few more other friends went to Tripura and joined the canp at Melaghar under No2 sector to be trained as guerrillas. After the training this band of Guerrillas were inducted into Dhaka for carring out operations against the occupied Pak Army known as the ‘Khan Senas’. All of them were my beloved close ones. This dare devil Guerrilla band created horror in the mind of the Khan Senas by executing unpresidented hair raising operations at the capital. Most of the ferocious operations carried out in Dhaka were the actions of this Guerrilla band. A few out of many worth mentioning were operation at the Inter Continental Hotel, Farm Gate operation, Shiddhir Ganj Power Plant operation, Demra operation, Gulberg Power Plant operation, Dhanmandi operation, Jatrabari operation, the daring operation to rescue Gen. Nurul Islam Shishu and Brig. Khaled musharrof’s family from the captivity of the Pak army and taking them across the border safely. The Jawans and the officers of the Pak Army including their higher commands at the headquarters were panicked and fearfully on their toes about the activities of this Guerrilla band. But one night during the war, due to the treachery of Farid, the younger brother of late Ivey Rahman an Awami League leader and wife of late President Zillur Rahman, the Pak Army carried out a Blitz Krieg operation and managed to capture most of the Guerrillas of this Band from various locations in the city including my father, all other male members of the family including the domestic aids. All were taken to the cantonment. Only two could escap alive from that operation. Kazi Kamaluddin and Shapan with a bullet injury at the back. However, those Guerrillas who were out of town that night remained safe and alive. None of the captured Guerrillas could come out from the cantonment alive due to appoling betrayal of the traitor Farid, a Mir Jafar incarnated! Captured Guerrillas were brutally tortured before they had to embress Sahadat. But some how the civilians who were taken into custody were also inhumanly tortured but not killed. Thus, all of them including my father, male family members and the domestic aids could be freed in almost half dead condition after the surrender of the Pakistan armed forces on 16th December 1971. Most of these Guerrillas came from affluent class and were stars in their university life having bright future in front. But being imbued with the spirit of patriotism and driven by self conscience against the unjust atrocities these golden brave sons of the soil shunned all attractions of worldly life and picked up arms and plunged in the liberation war to free their home land. Has the nation particularly the rulers who claims to be the champion of the spirit of ‘71 been able to give due respect and recognition to such valliant selfless freedom fighters? No one writes about their tales of heroism. No seminor or simposiam is arranged to praise their supreme sacrifices. They had perished unsung and neglected. A few who are still alive are leading a deplorable life. Some are even begging for their bare existence. On the contrary one can see two families headed by two ladies being at logger heads shamelessly scratching each other’s face or pulling their hairs riding on the shoulders of the innocent people just to establish the claim that Bangladesh is their ancestral property. There is no darth of seminar, simposiam, procession, public meeting, motor show headed by them. Off and on these are organized. Similarly, disghusting rat race is on for the most corrupt, characterless, scoundrel siblings of those two families to be established as the hair apperent crown prince of Bangladesh. Really, this is a strange country indeed! Don’t we have brave young men and women in the present generation to dispel this saying? Can it be expected in future generations? The nation who can not give or does not know how to give due recognition to the brave patriots, they can never claim to stand heads high with self respect. If this lesson of the history is not taken then the existence of an independent prospective Bangladesh will be vanquished. As a result, there would be no future of 18 Crores of Muslims population of Bangladesh. How this nefarious design had begun to know that those who are interested might read my published book ‘Kichu Kotha Kichu Betha’. If the book can’t be procured from the market then this could be read or down loaded from the web site www.majordalimbubangla.com. I with due respect had written the heroic tales of a few of my fellow unsung freedom fighters. They were not given their due recognition or any gallantry award inspite of my best efforts as the Advisor to the Sector Commanders or a Commander of the Mukti Fauj. With unbearable pain I had pened down the factual accounts of selfless dedication of those heroic fellow freedom fighters in the book ‘Kichu Kotha Kichu Betha’. Like those thousands of heroic tales of the freedom fighters had been suppressed in a planed way to marginalize the contribution of the freedom fighters in the eyes of the people at home and abroad for the sake of Indian interest in particular. In ’71 regardless of class difference what was the spirit of the greater majority of genuine, selfless and patriotic freedom fighters what was their mind set and aspiration. To have a better understanding in this regard for the present and future generations I shall mention below about two freedom fighters. Before my return for Germany after treatment Shapan and Kazi came back to the country after successfuly passing out from the IMA Dehradoon, but both refused to join the army. Shapan got engaged to reestablish his business at the same time concentrated to complete his MBA. Kazi became a member of the national bascket ball team of Pakistan while he was a university student. After complision of his studies Pakistan government sent him to Germany to be trained as a proffessional coach. On return he joined the sports federation of the than East Pakistan as an official. After liberation he decided to join Bangladesh sports federation as an official and alongside he started his own business. Gen. safiullah, Gen. Zia, Gen. Nurul Islam Shishu and Brig. Khaled Musharrof tried their utmost convincing them to join the army. But both remained steadfast to their decisions agaist their counselling. Their logical reply was that they had decided to join IMA as Cadets considering that the liberation war might get prolonged should it be allowed to continue its natural course and in that case the higher training at the IMA would become usefull. But while they were undergoing training the liberation war was not allowed to follow its natural course but hijacked by India and declaring war against Pakistan could easily achieve victory over the blood and weat pof the freedom fighters of the Mukti Fauj projecting to the people of earstwhile East Pakistan and the outside world that the independent state of Bangladesh is a gift of their victory over Pakistan. Such a premature independence through a cesarean operation might turn into defenceless enslavement in near future. In that case what would be the role of professional officers like you all that is not known. We had joined the war to fight our own war ourselves to liberate the country with out any expectation to become careerist officers. Should it be necessary any juncture in our life time to start another liberation war for protecting insecured independence then we shall again pick up arms being freedom fighters. such spirit and mind set reflected the charished dream of hundreds and thousands of nationalist patriotic freedom fighters and majority of the people. this charished dream has not been materialised till this date even after more than four decades due to the brtrayal, misrule, corruption and boot licking of their foreign masters of rulers men and women alike. The younger generation must also ponder who is responsible how much for this failure. the liberation war of ’71 could inspire the generation of that time with true spirit of nationalism. As they had broken all class barriers and merged with the commoners and fought united as one their, patriotism, conciousness about poluted political and social culture had sharpend. They all became more matured than their age. Therefore, they took resolute stand as an organized force on behalf of the greater majority of the down trodden people who had been unjustly persicuted, neglected, opressed and denied their just socio-economic and human rights for ages. Emergence of such an indominatible force was seen as a nightmare by the decadent tarmited vested interested quarters and as a result, they became targets of the killing sprees. State terrorism and ‘LAL GHORA’(Different Bahinies of party hoodlums and killing squards) were unleashed against them by none other than Sheikh Mujibur Rahman himself to start with followed by the others. It was again he who had boastfully introduced judicial killing in custody in newly independent Bangladesh. Though such atrocious brutality managed to suppress that spirit temporarily but ultimately all evil forces have to concede defeat to such a unified streanth which grows out of a bloody war based on the interest of the country and its people, this is the lesson of the history. Only such a united force imbued with the spirit of nationalism and interest of the vast majority can be the impregnable shield to ensure the existence of the country and the nation. The day I reached Dhaka, I received the messege that the Prime Minister desires to meet me at her residence at 9PM next day. Accordingly I reached at the appointed time. I was taken to the sitting room by the same fellow Mr. Falu with his teeths out. little kater Bhabi moved in scewing Paan masallah. I realised she was waiting anxiously. As I stood up and conveyed my Salam she indicated a sofa to sit and sat beside me. How was your trip to America? With out saying anything I took out three sealed envelops and handed over to her requesting to go through them. The right answer to this is not known to me as well. I replied. More I try to understand you more I get surprised. How can you get such difficult tasks so easily? I only try sincerely, The result is given by Allah Subhanwatala. You said it right, now tell me what should I do? We have a friend named Jim Corman. He had been elected uncontested as a Congressman from his constituency over three decades and held many important and responsibble offices. He is adored by all in the corridors of power as an experienced and influential person. He would be working as the linkman between you and other friends regarding all matters. He would also be your main advisor regarding your visit and how to develop your personal relationship with the invisible pillars at the corridors of power and finding solutions to any other complexities that might arise. I shall get him introduced initially to you once you decide to invite him. In that case, I should send him the invitation letter on my behalf at soon as possible so that he can visit at his earliest convinience. What do you say? Rightly so, but I thing it would be better not to have the first meeting in Dhaka but to a 3ed country. Afterwards as an old aquentence if you as the Prime Minister or personally call him whenever you desire that would be a normal affair and no one would view that suspeciously. Your reason is well understood. But at the moment I do not have any other schedule to have a foreign trip other than participating in the Commonwealth Summit in Zimbabwe beside visiting Beijing. In that case you can do one thing. You may consider to tell the Foreign Minister to include me as a member of the deligation in that Summit. Before that you have to arrange to send me the invitation letter for Jim secretly. I shall send that to Jim and request him to come over to Harare in time. In Harare during the Summit I shall arrange a secret meeting for you to meet Jim. While talking I had to take some home made cakes(Pithas) along with tea at Bhabi’s request. Okay, I shall be doing everything as you have suggested. Now I would like to seek your openion on two issues. Since I have formed the government Awami League and Jatiyo Party of Ershad have raised the demand to change the form of government from the Presidential to the West Minister style parliamentary government. On the other hand Jamyat is going to raise their demand to hold future national elections under a ‘care taker government’. I am hearing that they are going to launch their movements simultaniously on these two issues within and outside the parliament very soon. What is your considered openion on these two issues? In this regard, it should be you all who have to deliiberate diligently and take decisions. However, to me both these two issues look to be sinister moves having far fetched implications so that Bangladesh can ever have a stable government to function smoothly. This of course can be debatable. I shall not go into any detailed discusson but only humbly submit the Presidential government was introduced in Bangladesh for the first time by no other person but late Sheikh Mujibur Rahman who’s words were laws. Even then why was he compelled to introduce the Presidential form of government? And after taking over the state power why late President gen. Zia and fallen dictator Gen. Ershad continued to rule the country with the Presidential form of government? Before taking any decision on this issue these two questions need to be pondered seriously. The reasons why all these three rulers had decided to retain this system should be looked into thoroughly. There is no example of holding national elections under a care taker government anywhere in the world. In view of this an underdeveloped country like Bangladesh where more than two third people still lives below poverty line, in a country where all the governments who had come and gone uptill now had failed to meet the bare minimum requirements for the existence of its people such kind of experiment is nothing but a luxury that can’t be considered as the priority. Your priority should be the demands of the people rather than the demand of Jamayet which has got only 17 seats. Besides, in your election manifesto none of these two issues were included so you have no obligation to the people about these issues. In view of this, why you or your government should take the responsibility to oblige both Janayet and Awami League? You should explicitely explain to the people in this regard. Many are saying that I shall not be able to defeat Hasina in the Presidential election. I shall beg to differ with this speculation. Your party organizationally is weaker than Awami League even then you have won. Is it due to your party’s organizational streanth? Not at all. 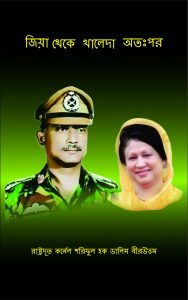 The people have voted you to victory as the wife of martyered President Gen. Ziaur Rahman and as a good Muslim, anti fascist and anti Indian non compromising leader. Your candidates have not got votes for their abilities, the votes have been casted to your party symbol ‘Pedy sheaf’(Dhaner Shish). Against this reality, those who are trying to say that you would be defeated against Hasina because her personal popularity is more than yours is irrational. Regrettably I must say that those who are saying so, their sole aim is to curtail your power. Immediately after the results of the elections were declared Hasina claimed in a press conference that there was discreet rigging in the elections. Simulteniously, she had also vouched that this government would not be allowed to remain in peace for a moment. In that context, should you decide to weaken yourself stepping into their trap and compromise to make a way for Hasina then that’s a different matter. I must also be candid many who are around are not sicerely loyal to you. They are self seeking oppurtunist doves who move with the pull of the strings of their foreign masters attached at their back. All their allegiances center around perpetuating their self interests. Do not forget, inability to identify friends and fows was one of the main reason for the premature sad demise of President Gen. Zia. Bhai, I shall once again requesting you to stand beside me as the Senior Minister. Bhabi having due respect to your sincerity being embarassed I must say again it is not practically possible any longer for me or any one of us to join BNP and do politics. Rather please try to keep up your promise that you had made yourself before the elections that if you win the elections and form the government then you will redress all the injustice that had been done to us so long and shall rehabilitate us in the society by bringing us back to the country. That would be more beneficial for both sides. Having said so I begged leave and came back home. From todays conversation one thing became clear. Hasina’s outrageous uuterances at the press conference were not just a threat, the conspiracy to destabilize Khaleda Zia’s government has already started with the connivance of the Chanaykas and RAW. India will never want that Bangladesh gets out from its radder and dares to persuse an independent foreign policy. Bangladesh unfortunately is surounded from three sides by India. This being the ground reality it can only move forward to progress and prosperity adopting a foreign policy centering around PRC at the same time attempts should be made to develop cordial relation with America and other Europian powers along with the member copuntries of the OIC on the basis of equality and mutual interest beside countries of the 3ed world. However, Bangladesh have to be carefull not to persue any policy with any other country which might create any misunderstanding in its bilateral relation with PRC. With out a clear perception in this regard it would not be possible to move forward in any front as an self reliant independent country. The country with enormous prospect will plunge into dark dungeon with the passage of time as a non viable failed state. Therefore, from the very on set utmost secrecy should be maintained. Because, before any bilateral relation is established on firm basis if it is divulged then any such initiative taken would be easily nipped in the bud by neiboring India which maintains powerful lobby all around the Globe spending millions of Dollars. i returned to Nairobi. from there I informed everything in details about my talks with the Prime Minister to Ganga Bhai and Jim. I also expalined why we have decided to have the introductory meeting at Harare. There after time was passing in anxity and uncertainity. At that jucture one day I received an unexpected call from the Foreign Minister. He complained that I had visited Dhaka and gone back with out meeting him. I got alermed at his such taunting remark! Has Bhabi revealed all about the plan trusting him? If she has done so then by now everything has been reached the South Block for sure and as a result all our efforts are bound to go down the drain. Not only that, if this golden opportunity is lost then the country and the nation will suffer the most. What Khaleda Zia will be losing personally that is not of any primary concern. After that call the wind started blowing from other way round! I saw doves like Moudud and others who had joined hands with Gen. Ershad stepping on the blood of Gen. Zia had got easily entrenched themselves again in BNP under the petycoat of Khaleda Zia with the patronization of party stalwarts like Badruddoza Choudhury and Col. Mustafizur Rahman. Through Brig. Hannan Shah Mr. Kader Siddiqi of Kaderia Bahini, who was convicted and awarded death sentence for treason during late President Gen. Ziaur Rahman’s tenure along with killers like Avi and Niru were brought back from India to be rehabilitated in the national politics after Presidential pardon. That wasn’t all. Khalrda’s government also awarded with a declaration of publishing a daily news paper and adequate fund was arranged from a bank for him to buy a sate of art press from abroad. On the other hand after installing Proff. Golam Azam as the Amir of the party Jamayet being a major ally started mounting pressure on Khaleda Zia to restore his nationality. Khaleda Zia tried to make Jamayet understand that it would be more appropriate to restore his nationality through court instead of an executive order. This was not accepted by Jamayet. They thought Khaleda Zia after winning the elections was trying to by pass the issue. Thus, tug of war had started between BNP and Jamayet. Taking advantage of this rift to enhance the distance between Jamayet and BNP at the dictate of the Chanayakas with Hasina’s all out support and assistance from no where under the leadership of Jahanara Imam a platform called ‘Ghatak dalal Nirmul Commitee’ sprouted. Co-Convenor was Col. Kazi Nuruzzaman Bir Uttam one of the sector commander during the liberation war. But both were just the figure heads. The main players behind the scene were Shahriar Kabir, C.R. Dutt, the organizer of ‘Hindu, Buddist, Christian Parisad’, Col. Osman, Col. Sawkat Ali, Muntasir Mamun, Hasan Imam, writer Shawkat Osman, Shamsur Rahman, Nilima Ibrahim, Kamal Lohani, Nasiruddin Bacchu, M.R.Akhtar Mukul, Sufiya Kamal, A.B.M.Musa, Asaduzzaman Nur, Kabir Choudhury, Gaffar Choudhury, Tuhin Afroz, Nirmulendu Gun, Barrister Amirul Islam etc. The establish a people’s court at the Surahwardy Uddan and carried out a mockery of trial and after awarding death sentence burned the effigy of Proff. Golam Azam in public with fun fair. After this drama, the alliance between BNP and Jamayet had broken down. Considering that to be the most appropriate opportunity Awami League allured Jamayet with a bait and Jamayet swallowed that bait. A classic manifestation of opportunism! After a few rounds of sevret parlays between the top leadership of Awami League including Sheikh Hasina and Jamayet it was decided that Awami League on the issue of parliamentary form of government and Jamayet on the issue of care taker government will launch vigorous movement together unitedly within parliament and outside on the street to pull down Khaleda’s government. Gen. Ershad’s Jatiyo Party would be their ally. Such understanding is nothing but ugly face of the politics with out any morality, values and iseology. After such a match making suddenly the wind from the sail of ‘Gha Da Nirmul Commitee’ depleted. Both Jahanara Imam and Col. Nuruzzaman realized that they have just been used by Hasina and her Awami League for political gains. With a heavy heart Jahanara Imam went away in self exile to USA and died there out of Cancer. Col. Nuruzzaman after realising his mistake retired from active politics for good. The events that followed were even more disappointing. Being embolden with Indian support Col. Mustafizur Rahman cautioned Khaleda Zia and made her convinced that her association with the leaders of Sena Parisad particularly me might turnout to be a nightmare for her. At an opportune moment I shall black mail her to own up 15th August and shall prove to the world that Gen. Zia was involved with the revolutionary uprising of 15th August which brought the political change in Bangladesh. As a result, due to the outrage of neighboring India it might become difficult for her government to stay in power. Some like minded bureaucrats, intellectuals, journalists and senior party leaders reminded Khaleda Zia that Shaheed Gen. Zia had started his politics after categorically denying in public that he had any kind of associassion with the historic revolutionary uprisings of 15th August and 7th November. There on, as dictated by Gen. Zia BNP’s position as a party had been that he succeeded to be at the center of power due to his personal popularity within the armed forces and the people. This is how without taking any responsibility for ‘Mujib’s killing’ he moved ahead on the basis of his 19 point political programe and had been successful in building his image as a popular leader. He also had also succeeded to compromise with big neighbor India stating in no uncertain terms that he had nothing to do with ‘Mujib’s killing’ whats so ever at any stage. To prove his submission he commited to the Indian government to bring back Sheikh Hasina from exile in India for rehabilitating her in the national politics assuring all kind of help and assistance for the sake of doing politics of co-existance. In view of this, any kind of relation that khaleda Zia maintains with us would prove to be perilous to the politics that had been initiated by her husband Gen. Zia. Not only that now if she decides to bring any change in the political equations and foreign relations persued by her husband then her government would become non functional. Even her life could be threatened due to the rage of India. Against this backdrop, considering all aspects from now it would not be logical for her to maintain any relation with the Sena Parisad, August revolution or it’s leaders. These paid lackies of India however, very tactfully avoided the most pertinant and important issues. After compromising with India just to prove that he was not associated with the revolutionary uprising of 15th August he allowed Sheikh Hasina to return to Bangladesh with unusual state protocol when Awami League was getting fragmented in four pieces due to internal power struggle but on the 13th day after her return Gen. Zia had to pay a heavy price. He was slained in a conspiratorial abortive coup attempt hatched up by RAW. There is an age old saying, ‘As you sow so you reap’. The imposters did not even told her that India right after independence has been harboring the dream to be a world power. The pre condition to materialize this cherished dream India must establish itself as the pre dominating power in the sub-continent. The wizards at the South Block ever since are trying relentlessly to regain their ‘Bharat Mata’ following the ‘Nehru Doctrain’. As long as the artificially “Indian Union’ a quire creation of the colonial British Empire exsists the ruling elites of India will not change an iota from its sinister endeavor no matter how much consession the neighboring countries make. Annexation of Kashmir, Hyedrabad, Goya, Daman, Deu and Sikkim with armed aggretion and attempts to subdue all the secessionist movements in different states bringing them under the center with emergency and brute force are glaring examples of that. Therefore, rationally it can be said so long this artificially created ‘Indian Union’ forcefully created by the aggresive outside invading British colonialist power for maximizing their interests snatching away the homelands of distinctly different ethnic nations will not disintrigate in the historic perspective there can’t be any durable stability in this region of South Asian Sub continent. As a result the plight of more than one fourth of mankind shall never improve as the stability is pre requisite for any socio-economic progress. India was never one country. That is why different nations initiated and are continuing with their struggle for regaining their lost separate self identity and independence till this date soon after Hindustan came into existence as an independent country and British had left. Such movements within India is gaining streanth with every passing day and spreading fast in different regions within India inspite of military intervention by bringing them under the central government’s rule, severe persecution, repression and brutal oppression. Sacrificing blood of any nation for freedom never goes in vain. The independence struggle may be prolongated, the freedom fighters can be martyred but the spirit for freedom can never be defeated. Bangladesh and Vietnam are two most burning examples in the contemporary history. ‘Man is born free and wants to live with freedom’. This natural phenomenon is being abided by the indomitable rising world power historically rest of the world powers shall have to accept this reality sooner or later for their own interests and world peace and stability. Any arrogance to deny this devine phenomenon will destroy the present civilization like many in the past. Due to political immaturity, short sighted power centric wrong decision of Khaleda Zia, Jim’s invitation and intimation of my inclusion in the list of deligates were not received. As a result, the rare opportunity for persuing an independent balancing foreign policy to counter undue Indian pressure to consolidate our independence and to move ahead for a brighter future got lost. Jim, all our sincere efforts had gone in vein. It had been good, as at the very beginning we have been able to see through the real character and competence of Khaleda. So, why are you upset? Khaleda or Hasina are not immortals, both will get lost from the scene one day but Bangladesh will stay. Now, I must tell you something for your consumption, The character traits, foresight and prudence are basically responsible for any country and nation’s progress or backwardness. Later I learned that the Foreign Minister through one of his nephew living in USA got introduced to one Mr. Kanju, a wealthy businessman and top RAW operative. He managed an invitation for khaleda Zia to participate in the Presidential annual ‘Mass brakefast prayer’ spending millions of Dollars. On this occation about 100 heads of state or government and lumineries from around the world are invited. After the Mass followed by brakefast and a photo session the ceremony finishes. According to the prevailing practice none of the invisible powerful individuals participate in that ceremonious get togather. During this visit she was received at the airport by a deputy assistant under secretary of state of the state department. Bangladesh Embassy had published the news of her visit in Washington Post spending a heafty amount. Before leaving Khaleda Zia arranged a brakefast meeting at her hotel where she invited some of the friends but none had obliged her. Khaleda felt despondant and humiliated. Jim had called and apprised me about all these. What an irony! Being influenced by the conspiracy of the Indian lackies Khaleda Zia, the so called champion of the nationalist cause and religious values could not utilize the rare opportunity to streanthen by lateral relations with United States of America that was offered to her. After the fiasco I was continuing with ny duties as the High Commissioner. As the Doyan of the diplomatic corps I had to remain occupied with some other obligations other than normal routine. At the same time I was watching the political drama of compromise back at home. New issues were being added every passing day in the coordinated movement of Awami League, Jamayet and Jatiyo Party against Khaleda Zia’s government as planned. At the same time from the infamos ‘Hawa Bhaban’ Tareq Zia’s and his close cronie’s over bearing high handedness, wanton corruption, unwarrented interfearence in the decisions of the government and party, internal fudes nearly cornered Khaleda Zia helplessly. At that juncture suddenly appointing Tareq Zia the senior vice Chairman of the party over the heads of many senior party leaders Khaleda Zia added fuel to fire. The internal feud within the party intensified. The senior leaders were unhappy with this decision to introduce plutocracy within the party and virtually lost interest and had became inactive. This also had an adverse reflection among the party caders and activists. As the tested and sacrificing members were not duely recognized they also became despondant. On the otherhand Tareq Zia’s maneuvering from ‘Hawa Bhaban’ almost made the whole government mechinary ineffective. The entire bureaucracy and state institutions were in shamble. In such a dismal situation Khaleda Zia gave in to the demand of Awami League. She changed the form of government from the Presidential to Parliamentary form. After scoring this victory as she refused to accept the demand to hold the national elections under a care taker government the untied movement of the opposition parties under the leadership of Awami League and Jamayet combine intensified almost to the point of no return. In such a precarious situation the enemies within also started flexing their muscles. Particularly, her able and powerfull son Tareq Zia and his cohorts, Koko, Sayed Iskandar, Chocolet Apa and the boot lickers at the ‘Hawa Bhaban’ threw away the mith of Zia’s ‘Torne vest and broken suitcase’ to the dustbin and got involved in ramphant corruptions. Due to mega corruption the Zia family became fabulously rich over night. Khaleda Zia like an Ostrich dipped her head into the sand deun and remained tight lipped pretending as if she could not see anything untowards that were happening. Though aging compared to that her fancy about French Shiffon Sarees, expensive Jewelleries and Wigs was getting more and more intense. Her popularity was also waning due to failures of fulfilling her election pledges. More the government of Khaleda Zia was getting weaker Awami Jote was mounting more pressure within the parliament and outside on the street. This is how her tenure was finishing and she announced elections under her government like dictator Gen. Ershad. The election was boycotted by Awami League, Jamayet and jatiyo Party so, the elections turned into a furse. After such thoughtless decision Khaleda’s position became even more precarious and weak. So, having no other alternative she conceded to the demand of Jamayet as well and introduced the system of holding national elections under a ‘care taker government’ through constitutional amendments and stepped down dissolving the parliament after handing over power to her party’s nominated President Abdur Rahman Biswas. The President nominated a care taker government. Awami League, Jamayet and Jatiyo party were not happy with that. Therefore, Hasina and her mentor RAW attempted to stage a Coup De’tat against President Biswas through Gen. Nasim, Chief of Army Staff nominated by Khaleda Zia’s brother Maj.(R)Sayed Iskandar. Being sanguined that the Coup against the weaker government of President Abdur Rahman Biswas would be successful Hasina openly supported Gen. Nasim’s initiative exactly in the same manner she had supported Gen. Ershad when he forced the ailing elected President Sattar to hand over the power to him at the gun point. But in the face of stiff resistence organized by a few brave nationalist senior commanders Gen. Nasim’s Coup attempt was foiled. Among those Gen. Imamuzzaman, Gen. Matin, Gen. Bhuiya and Gen. Mahbub’s names are worth mentioning. Thereafter, under a neutral person an acceptable care taker government to all the major parties was formed and the elections of 1996 was held. In that election no party could manage to get single majority required to form the government. At that juncture Khaleda Zia shamefully begged support from the despotic dictator Gen. Ershad leaving aside all their ideals and knowing that Gen. Ershad as a RAW agent had a hand in Gen. Zia’s brutal killing along with Gen. Manjur and 18 other senior freedom fighter officers just for the lust of power but failed. On the other hand Sheikh hasina had the last laugh at this measurable plight of Khalrfa Zia and formed the government she being the Prime Minister with the support of Gen. Ershad’s Jatiyo Party and Proff. Golam Azam’s Jamayet e Islami. In this elections khaleda Zia’s party got 116 seats and after failing to get support from JP and Jamayet e Islami she sat in the parliament as the leader of the opposition. Jamayet’s number of seats came down from 17 to 3. However, due to the favor of Sheikh Hasina’s government Proff. Golam Azam could het back his citizenship. Gen. Ershad could also managed to come out from the Jail. The ring leader of the abortive Coup Gen. Nasim and his cohorts were all exonerated from all the punishments they were awarded the Court Martial trial by Hasina’s government including their dismissal orders so that they could enjoy all retirement benefits. Let us now go back to the saga of my retirement from the service once again at Nairobi before the elections of 1996. I and Nimmi had performed our Hajj along with Khalamma and Chacha in 1993. On return to Nairobi we faced a severe calamity. One morning after hearing the Azan for Fajar nimmi was leaving the bed for the attached wash room for her Ojuh. As she stepped down she fell on the floor with a scream. I immediately woke up and found her on the floor quivering in excuisite pain and totally unmovable! Somehow, I lifted her back to the bed and had called for the ambulance. She was carefully moved to the hospital. It was suspected to be a case of slip disk. After all kind of tests and MRI the specialist had opined that one of her disk on the lower lumber had been badly degenerated and collapsed. We were stunt! Nimmi had been allthrough very health conscious. She had been doing her daily work out regularly and was very carefull about her diet. Therefore, it was unbelievable that such a thing could happen to her! She was completely bed ridden and her neck, hands and feets were under traction for long one and half month. After one and half month she could walk little distance with the support of a walking stick with much difficulties and agonizing pain. She forced us to bring her back home in that condition. The treatment continued. The Orthopedic and Neuron surgeons along with the Physiotherapists started coming to the residence as scheduled. Knowing about her accident all the near reletives rushed to Nairobi. Shapan and Keya had been suffering from similar kind of back problem and were nearly getting crippled. taking the advice from one of Shapan’s friend both had gone to Singapore to consult with a famous Orthopedic Surgeon Dr. freddy Chu. He after inspectimg them clearly said that chances of success of any spinal surgery is fifty fifty so, he would not recommend that but instead he would prefer to treat them with traditional Chinese method if they like. As they agreed, both were treated by him and recovered fully over a period of time. As they insisted I took Nimmi to Dr. fredy Chu. Shapan had made all the arrangements. After examining her he said her case was much more complicated than Shapan and Keya so, she would be required to come to Singapore for two weeks after every three months. She would be treated by him and an experienced Chinese Physiotherapist during those two weeks. This is how the first one year will go. Thereafter, schedule could be changed depending on her progress. The treatment started. With the time she had been progressing much faster than it was expected due to the treatment and kind mercy of Allah Subhan Wa Tala, the most gracious and most mercifull. By the end of first year Nimmi recovered a lot. Watching her recovery Dr. Fredy Chu decided in the second year she would be visiting twice after every six months instead of every three months. During the first half of the second year Nimmi was almost normal. She was doing her workout as prescribed, walking regularly and following her diet chart religiously. But she was advised to carry the walking stick as a handy tool to protect herself from any mishap. Revoval from the service is nothing new in your chequred carrier. You also remained alive even after five fetal attempts on your life. Through all these calamities the Great Creator and our Sustainer had been kind to show you the right path to move ahead in the past likewise in future also His blessings would be on you to find the right path through which He would achieve whatever He desires to obtain out of you. This is my firm conviction. You must not be sad but face everything like a brave freedom fighter. Rabbul Alamin is all knowing and watching everything. The way you have completely surrendered to Him with firm faith and shunning all worldly attractions selflessly taken a solemn vow to dedicate yourself for the cause of the humanity and Muslim Ummah just for earning his pleasure and moving forward crossing many arduous ups and downs basing on His mercy, I have no doubt in my mind that you would be certainly rewarded by Him here in this word and here after. He would also do justice to all wrong doings and unjust acts. This Rabbani Khan is a strangely unique person! He is a piece of Diamond more precious than the Kohinoor. His spiritual vision is more than an ocean. Though in the worldly life his attenments and credentials are envious but at heart he is a Fakir in true sense and meaning of the word. Alongside rendering all his worldly responsibilities with a unflinching faith he with utmost sincerity he is doing everything that is needed to be closer to his Allah, the All Mighty Creator and the Sustainer behind everybody’s eyes. His depth of imagination and thought process had ober helmned me from the very beginning I had become closer. Though he is a mortal like any one of us but at times he appeared to be someone from other worlds!